If you look at the two pictures above, you can see that the Hummingbird Bakery's cream cheese topping (the picture up top) is far thicker and much more substantial than the cream cheese toppings that I have produced so far. I had disobeyed one of my key rules -- bringing ingredients down to room temperature in order to help facilitate the mixing process. 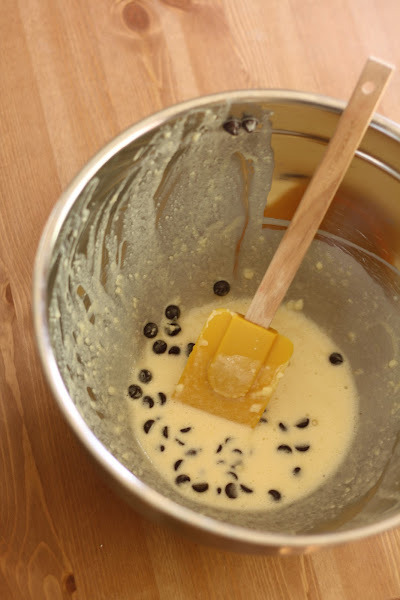 Ingredients have a hard time mixing together properly if they're not at room temperature; for instance, mixing cold ingredients often results in lumpy, thick, and undermixed batters. This time around, I set it up perfectly. I remembered to bring both the cream cheese AND the egg down to room temperature. 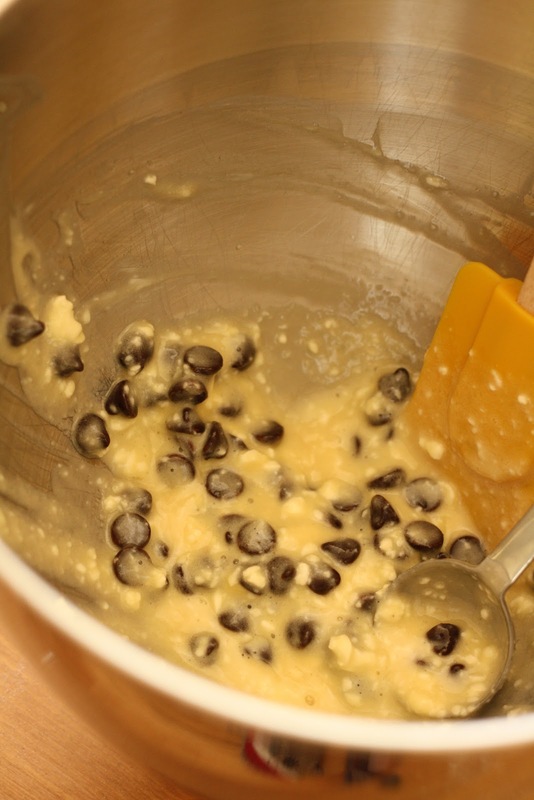 Indeed, when the two ingredients were mixed together (along with 1/3 cup of sugar, vanilla, and chocolate chips), the resulting batter was smooth and significantly less clumpy than its predecessors. 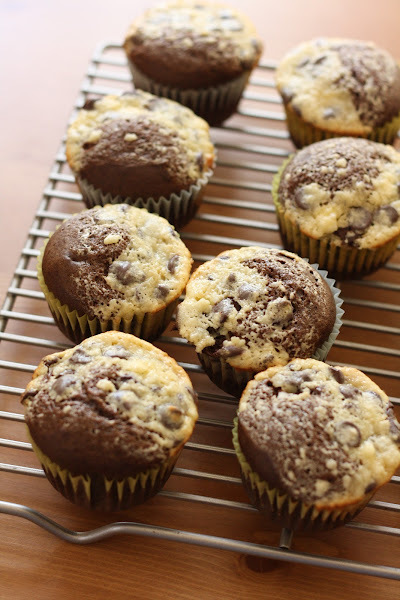 The perfectly smooth cream cheese batter had spread during the baking process, leaving unattractive cream cheese residue on the chocolate base of the cupcake! If you compare back to the original picture of Hummingbird Bakery Black Bottom cupcakes, a big part of their aesthetic is the separation between the cream cheese and chocolate cake parts of the cake. Take a close look at the picture above. 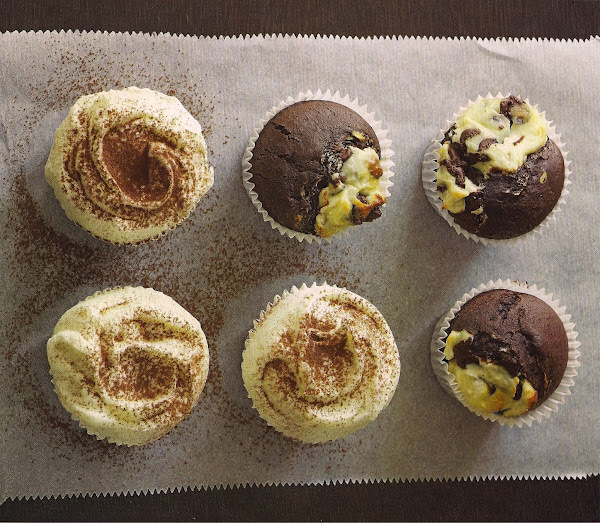 The cupcakes to the left are those made with both the cream cheese and egg at room temperature. The cupcakes to the right are those made with room temperature cream cheese, but with a cold egg. My guess is that having a cold egg combined with room temperature cream cheese made the batter thicker; the cold egg wasn't able to incorporate itself as easily as opposed to the egg that had been at room temperature. This mix of cold and warm ingredients produced a more gelatinous batter that was able to resist spreading out during the baking process. At this point, I'm pretty sure that the Hummingbird Bakery uses cornstarch to produce the thick, cream cheese topping that you see in their photo. I was initially going to add a little bit of cornstarch to the cream cheese batter to thicken it up, but I tend to err on the side of "natural looking foods that taste good" as opposed to "picturesque foods that look beautiful but taste not-so-great" (think fondant wedding cakes). So, going forward, I think I'll be using a cold egg to go mix with my room-temperature cream cheese to get that Hummingbird Bakery result. And I think that's a wrap! I know many of you are wondering why I'm fussing over such a miniscule detail like cream cheese topping spread. I know, I know -- I'm a little embarrassed myself. But the goal of this blog is to recreate Hummingbird Bakery cupcakes to the best of my ability and I refuse to settle for something less! I know it's boring to be reading about the process of baking cupcakes and that everybody just wants finished recipes right away. Nonetheless, thank you for indulging my nitpicking. I'll be posting the final, adapted recipe for high-altitude Hummingbird Bakery Black Bottom cupcakes for the next post. Stay tuned!